Last week, walking on a dirt path along the Marina, lost in thought about my mother and her lost voice, her buried dreams, I almost stepped on a snake. Brown and rust red, it had slid half way out of the dry grasses and onto the path where I stopped just short, maybe a foot away. We were both startled, still for a moment, until the snake made a quick turn back to the grass cover and disappeared. This is the second snake I’ve seen this month, after not seeing one for years. Perhaps it is the drought that brings them into the open, searching for water. Perhaps I have been preoccupied and missed them.Perhaps it is time we women move out of the grass ourselves and into the open, visible on the path. That is what I heard, anyway, from the snake. My son is driving us along a country road, surrounded by green grassy hills, blooming with wild mustard. Next to the side of the road, slithering in the grass, I spot two thirty foot black snakes undulating like water in the broad blades of grass moving parallel to the road. They have gold symbols or lettering the length of their sides. It looks like Moorish writing perhaps, blocky and bold, brilliantly gold. They have come out of the body of a third huge snake which was uncovered by the diggers on the hill just above us. “Stop the car!” I shout and run out of the car to watch them. They travel for a ways along the road, then move back into deeper grass, the woods. At first I worry that the diggers have disturbed the snakes, maybe hurting them. But as I reflect, I realize they in fact are archaeologists who have uncovered and released the snakes from an ancient burial mound. The Goddess has emerged. I get back in the car, so we can drive to a family picnic. The snake is one of the oldest symbols of feminine power, from a time when both women and the serpent were considered sacred. It was known that snake communicates with the Divine, expresses the numinous, the miraculous. Jung said the serpent is a symbol of 7,000 meanings. I am wondering how in the world I can write a snake story without writing a novel? The story is getting even longer. I just discovered today, July 25th, is a Mayan “Day out of Time” when the veils between the worlds are thinnest. 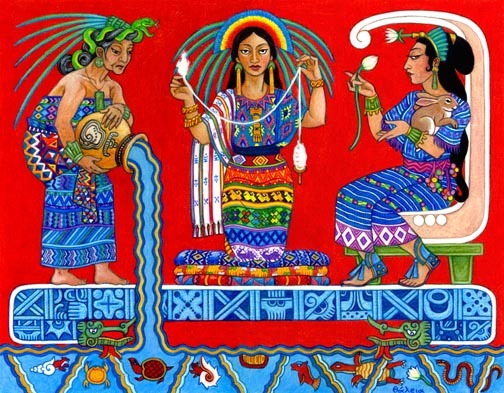 It is a day to honor the Mayan Moon Goddess Chak Chel, the Crone aspect of Ix Chel. Depicted in the image here, the serpent headdress shows she has sacred knowledge, intuitive powers, and wisdom of the sciences and of medicine. Chak Chel, “Great Rainbow”, is responsible for the fertility of the land, of humanity, and is the elder teacher of midwives. Keeper of sacred mysteries, she is also midwife of “What is to Come.” She knows what must be done away with before “what is to come” can be built. She brings us the knowledge and the wisdom to make this happen. In early Maya culture, elder women were revered and respected, their knowledge and experience essential to daily survival for the people. Chak Chel has a clay pot full of rainwater and herbs from which, when in a good mood, she pours blessings upon the world, but, when vexed, she sends forth storms, floods and hurricanes. In alchemy, the snake represented “ a thinking from the intestines, from the depths as opposed to an academic intellect which is often empty and does not always agree with us…a knowledge that comes from the blood.” (Jung) This wiseblood connects us to our wild nature within, and to Nature’s wisdom in the world. How can you gain access to the gifts, capacities, stories of the Wild and Sacred Feminine within? To rewild our psyches, to reclaim our Wild Feminine wisdom, we pay attention to our dreams. We listen to the still, small voice of our intuition. We spend time in Nature. We attend and attune to what we truly love. There are many paths, many teachings, many mentors. You will know which ones are for you, which ones bring you alive. Go do that. Seek your new story, which wants to be born in you. Pay attention to the images and intuitions which come to you directly from the archetypal field. Jung called this field of images and energies the collective unconscious. Biologist and visionary scientist Rupert Sheldrake named it the morphogenetic field. We all exist within this universal field, and have direct access to its store of wisdom and new possibilities. We need to learn the truth about some of the lies, the misshapen stories, handed down to us about women and feminine power. Like the more familiar story and images of Medusa as a fearsome, raging monster, the Gorgon, who can turn men to stone with just one cold glance. But the real story of Medusa is her position as Goddess, representing female wisdom, medha, also the crone aspect of the Triple Goddess. Athena was the young aspect, the daughter of Metis who was swallowed by Zeus, jealous of her wisdom and power. Another Moon Goddess, Medusa has come down through history to us as a raging, man-hating monster rather than the Libyan serpent goddess she truly was. The chthonic one, embodying the spirit of nature within, the protector of women’s wisdom and female mysteries. Thinking with Wild Mind is our awakened feeling for the earth and what is happening to her and all her creatures. In a short statement by a Zulu Sangoma (healer) Vusamazulu Credo Mutwa describes the weaving path, the spiral path of Mother Mind, Grandmother Mind, in contrast to Warrior Mind: linear, rational, analytic, competitive, focused on an individualistic goal. The images and energies of Warrior leadership have prevailed for over 5,000 years. When we awaken, embody, and express the energies and consciousness of Wild Mind, the Wild Feminine, we are free to moves sideways, graceful like water, in an evergrowing inclusive spiral of patterns and energies. The openness to what is new and trying to be born, the acceptance of Not-Knowing, the wisdom of collective intelligence are some of the attributes of Wild Mind. It is an indigenous mind. It is also the mind of new science, which speaks with the voice of the Feminine. As chthonic beings, Wild Women of the earth, we are related to the deities and spirits of the underworld. We must become self-earthed, humble, embodying ancient wisdom. Most of us have been cut off at the roots, separated from our own deepest sourceground of power hidden in the dark, in the earth, in the underground. When we return to being indigenous, which means native, indwelling, deep rooted, we are “born from within” and thus have access to our fullest capacities for creativity, intuition, seeing in the dark, the capacity for transformation. Joseph Campbell often asserted the need for a new planetary mythology, one based on the crisis and conditions of our times. The Time Is Now. A chthonic being. Medusa was the inventor of the alphabet, guardian of female secrets of birth and death, especially of the mystery of wise lunar blood. Wise blood. The gold letters on the sides of my dream snakes shine as the divine sparks of light which are hidden in matter. These dream letters communicate, record, carry the secret history of ancient feminine wisdom. What treasures of gold are hidden in your depths, the roots of who you are? 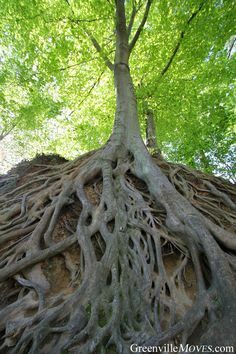 The roots that stretch out underground to connect us to one another. Many indigenous traditions have essential stories, myths, legends about Snake. There is the Aboriginal Rainbow Serpent, or the Navajo Snake Woman of the Beautyway ceremony, celebrating her heroic journey. One, as an energy and image of feminine power and knowledge she is not evil but creative and wise. Two, she reminds us to move like water, weaving and graceful, trusting the nonlinear soul path. Three, she unites the opposites, upper and lower, dark and light. We need both our light and our shadow. Four, she is the Divine spark of creation in our bodies. We have everything we need. Five, snake is capable of endless renewal, growth and transformation. You have unlimited capacities to shed your old skin and expand. Six, she is the voice of your intuition, healing and enlightenment, sitting there as Kundalini energy at the base of your spine. Already in you, with us. Seven, she carries prophecies for the future, connecting you to your wild embodied wisdom. Honoring your dreams, your values, your heart, she calls you to take action to midwife “What is to Come”. For us to fully claim feminine power and female vision as women leaders, we need the Wild and Sacred Feminine archetypal energies and ways of knowing. Otherwise we are limited to the narrow shallow topics of diversity, and equity, and balance, which cannot shift our consciousness or change the world. We have plenty of facts and information proving the efficacy, profitability and numerous benefits of having more women on boards, as leaders, in business and government. Yet little changes. Why is this? It makes no (rational) sense. It only makes sense when we go a bit deeper: To the fears of feminine power that both women and men carry. The fear of the mysterious, the numinous, the magical, the transformative. If early feminism in the 60’s was about Athena, helping us to become successful as Father’s Daughters, then now is the time to really embody the wisdom and magic of Chak Chel, of Medusa, of the Beautyway, to follow the law of Aphrodite, the Law of Love. We are being called to go beyond what we can see and know, accepting our kuleana, our responsibility, to take care of what we love. In 2012, a group gathered on the land of one of the Thirteen Indigenous Grandmothers – Flor de Mayo in New Mexico. During a powerful ceremony, several Mayan male elders spoke of the prophecy that Now was the time to transfer the staff of power from the masculine, where it has been for thousands of years, to the feminine. Now is the time for feminine leadership, with men forming a protective circle around the women. The participants at the ceremony agreed to make the news public, to help empower women around the world to stand and claim their power, to take leadership. This ceremony echoed the frequently heard Native American prophecy attributed to the Hopi: “When the Grandmothers speak, the world will heal”. We are strongly rooted in our integrative power when we are self earthed, secure in our nature by deepening our connection to the archetypal Wild and Sacred Feminine. We need to befriend what is wild and sacred and feminine in us. This is the key to personal and planetary transformation. In the old story, the worldview of separate and independent objects and people, of a linear causality, of a static time and space, these experiences of synchronicity, these glimpses of other dimensions through symbolic intuition, would be impossible. Yet they happen: My sightings of the snakes. The recent snake dream. 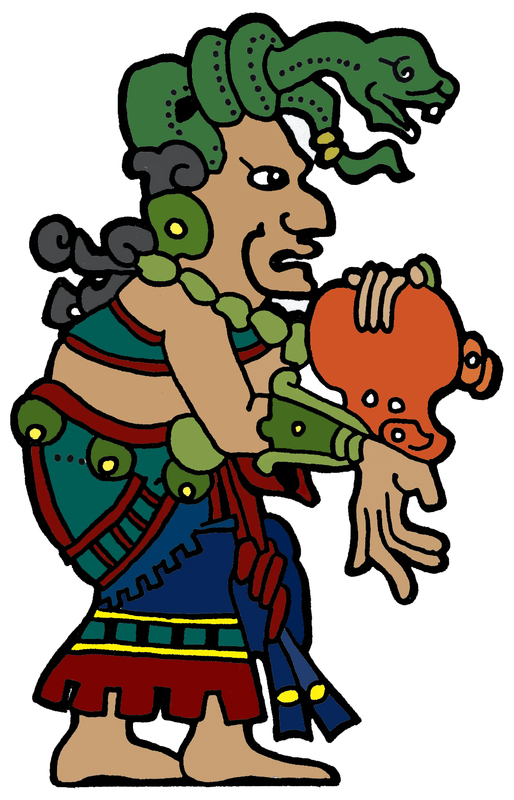 The Mayan holy day honoring Chak Chel. In astrology, the stationing of Venus that calls us inward, to really get clear on what we truly love. Empowers us to follow that Law of Love as our creative genius. I especially call to the Grandmothers. The wisewomen, to remember. To use the skill learned and successes achieved as Father’s Daughters, in a masculine world, to the urgent issues of this time fully reclaiming our feminine power and female vision. It is a propitious time to do so.